Merci pour ces précieuses informations , David , surtout pour moi qui ne suis pas musicien . Merci David pour cette liste ! 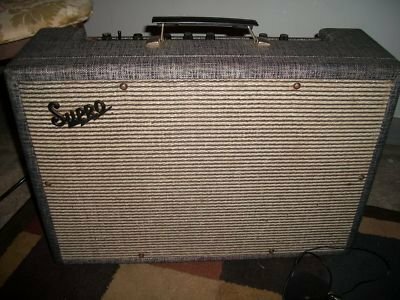 Au niveau ampli, il est important d'y ajouter la marque Supro, et plus précisément le modèle 1624T dual tone, sur lequel il a enregistré la totalité du premier album. Ce serait donc ça ? Yes exact ! 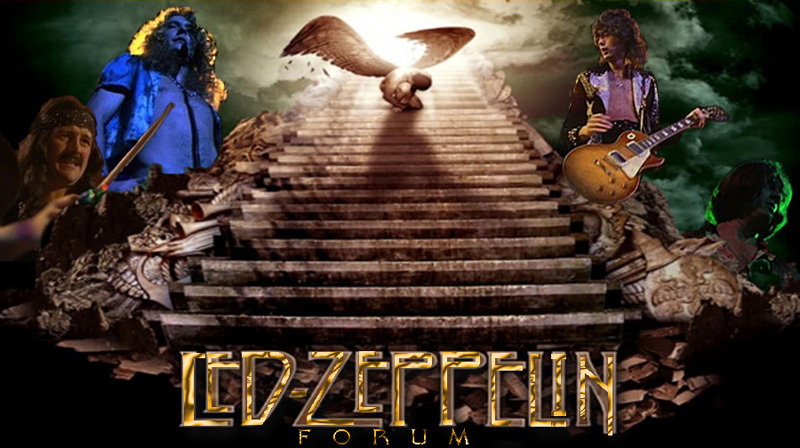 Il a enregistré Led Zeppelin I avec ce putain combo a lampes qui ne fait que 5w me semble-t-il..
Bien avant l'ère de la Les Paul qui deviendra pour nombre de fans l'emblème de Mr Page associé aux solos démens de Led Zep (il suffit de voir l'image d’accueil du forum Razz ), se trouve une autre guitare toute aussi passionnante qui a participé à l’ascension de Page en tant que guitariste, à celle du dirigeable, ainsi qu'à l'apogée discographique du groupe. 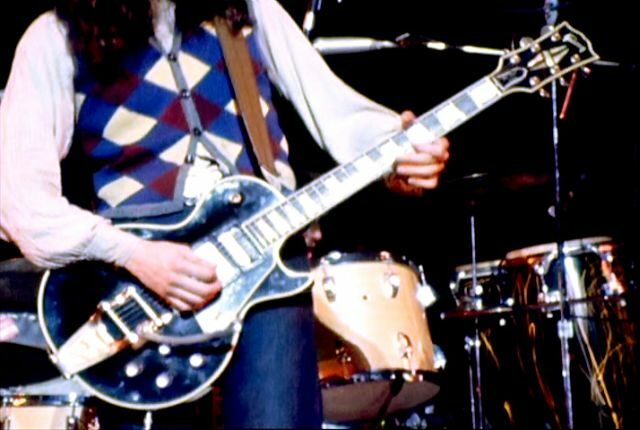 The extended Jimmy Page guitar solo in the song's final section was played for the recording on a 1959 Fender Telecaster given to him by Jeff Beck (an instrument he used extensively with the Yardbirds) plugged into a Supro amplifier, although in an interview he gave to Guitar World magazine, Page also claimed, "It could have been a Marshall, but I can't remember". 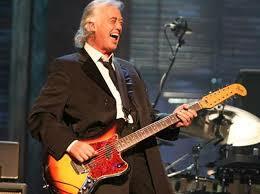 "I still have it (referring to the Dragon Tele), but it’s a tragic story. I went on tour with the ’59 Les Paul that I bought from Joe Walsh, and when I got back, a friend of mine had kindly painted over my paint job. He said, "I’ve got a present for you.” He thought he had done me a real favor. As you can guess, I wasn't real happy about that. His paint job totally screwed up the sound and the wiring, so only the neck pickup worked. I salvaged the neck and put it on my brown Tele string bender that I used in the Firm. As for the body… it will never be seen again! (laughs)"
En espérant que ça vous intéresse :)Si vous avez d'autres informations ou vidéos/photos concernant cette merveille je serais ravi de pouvoir compléter ce sujet. Concernant la dernière vidéo il s'agît de l'ère post-zeppelin, où Page revient ici à ses premiers amours de la telecaster (tournée avec Beck et Clapton oblige :P ). 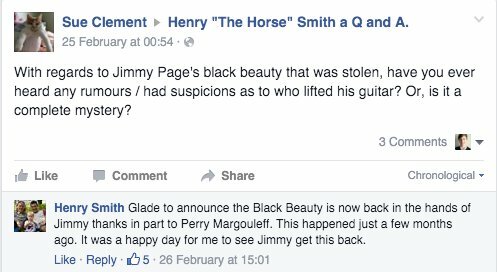 According to a statement made by former Led Zeppelin roadie Henry "The Horse" Smith on a Facebook Q & A, Jimmy Page has been reunited with his 1960 Gibson Les Paul Custom "Black Beauty"in the past few months. The 1960 Gibson Les Paul Custom 'Black Beauty' was purchased new in 1962 for £185. It was used for most of Jimmy's sessionwork (1963-1966), and was taken on tour, starting on January 7, 1970 at Birmingham, England's Town Hall through Apr. 1970, when it was stolen at the airport between Apr. 13 or 14, 1970. Jimmy Page placed an ad in Rolling Stone with reward, but it was never recovered. The exact details of how the guitar was recovered is not known at this time, however, a message has been put in to someone inolved, so check back! Notons que l'echoplex n'est pas une ''pedale'' d'effet. Par contre il utilisait le preamp de l'echoplex comme boost (d'ou la pedale actuelle), comme Blackmore et son magneto. » *Listing du matos des grand beatmakers!! !